Little Girl: Where is your other leg? Little Girl: I'll go look for it. And the man burst out laughing. Clowns can deal with things like poverty, death, loneliness, fear... with a simplicity and honesty that is arresting. This week we have had poetic windows opened with clowns posting personal ads in the newspaper, looking for love to escape their loneliness... clowns going to see their psychologist to deal with their personal problems. All very very funny and often with staggering depth. Poetry in simplicity. Children know much more than we think. But somewhere along the line we get lost. We grow up. We forget how to stay in the present moment. What a pity. 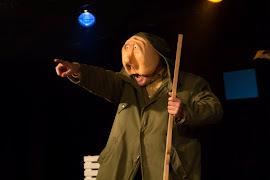 One of the interesting things about clown, we have learnt, is that whilst simultaneously being right there on stage addressing the audience directly they are at the same time completely in the imagined world... Like talking to an Elephant in the Kalahari Desert... Hello Elephant. Meanwhile... I am also making another mask... on the other side of the life spectrum... an old lady. In our very first project this year we did a piece about old people and old age. It was an unmasked piece and I thought a nice tie up to this year would be to end with a mask inspired by that work... which changed how I see theatre. Deep. But it's true. My work-in-progress mask mould... Slowly something arrives as Matteo our ever brilliant mask teacher says.